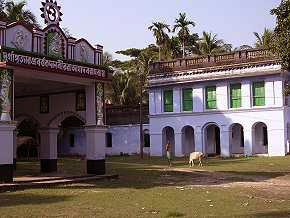 Contai (Kanthi or কাঁথি) is head quarters of Contai subdivision in Purba Medinipur district, West Bengal, India. There are three community development blocks in Contai. According to the geologists, the present geographical dimension of contai, has formally came into existence, with the great natural disaster of the third century A.D.(flood) which created Chilka lake out of the Chilka Bay. Kanthi that is contai means “Sand bound reefs” or sand walls. The name contai may thus bean English expression of the locale jargon meaning Sand heaps. Contai is about 160 km away from Kolkata and 30 km from the beach town Digha. Contai is well-connected by roads/highways with other nearby cities and towns like, Digha, Dantan, Jhargram, Kharagpur, Midnapore, Tamluk, Haldia, Howrah, and Kolkata. The town is also connected by a rail link to Howrah/Kolkata which is again extended to Digha.The rail line is believed to have given a rise to the local economy. For local transportation, bus, mini-bus, taxi, and cycle rickshaws are available. The opening of Central Bus-stand has eased the traffic congestion within the city to a great deal. The region holds great potential in tourism but lamentably enough, no other place except Digha has been developed properly. Among many festivals in Contai, "Gandhi Mela" is the most popular. It is held during January/February each year. Many people from Contai and neighbouring subdivisions take part in "Gandhi Mela" not only for amusement but also for agricultural and industrial exhibitions.There is also some cultural institution like Contai Bramho Samaj, Contai Harisabha etc. 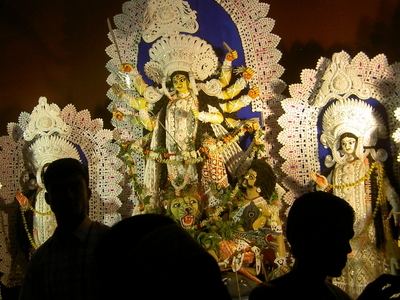 The regular Bengali festivals like Durga Puja, Saraswati Puja and Kali Puja are well attended. Other common pujas in the worship of Sitala, Jagaddhatri, Holi, Janmastami, Bheema Puja also takes place. Contai is famous for Pital Kansa Silpo and Madur Silpo. Here's the our members favorite photos of "Towns & Villages in West Bengal". Upload your photo of Contai!